With a few ingredients and a couple cooking tricks, you will have the best roasted chicken breast ever! 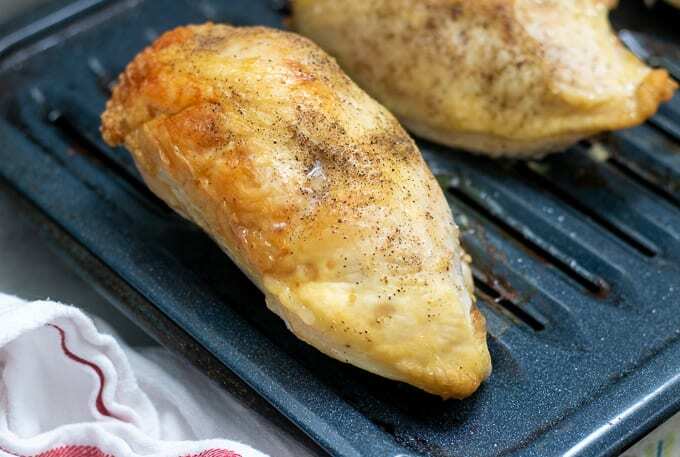 This easy recipe for Oven Roasted Chicken Breasts will give you juicy, flavorful chicken every single time! Making a perfectly oven roasted chicken breast is a skill all cooks should master. When chicken breast is roasted perfectly, it is juicy, full of flavor and a healthy, low fat source of protein. Yet chicken breasts have the reputation of being dry and flavorless. That is just because the chicken breast has been prepared without the right technique. Whether you are looking for a main entree, or pre-cooked chicken for a family favorite dish, this recipe for roast chicken breast will work perfectly for you. Oven Roasted Chicken is delicious enough to be served with a baked potato for a family meal or shredded and used in Chicken Pot Pie. And roasting chicken is as simple as a few pantry staples and one kitchen tool! For the most flavorful chicken breast, you need to choose bone-in, skin on chicken breasts. Both the bones and the skin will help to flavor the chicken as it cooks, along with helping to keep the chicken juicy. If you do not like eating chicken skin, do not worry, just remove skin after roasting. 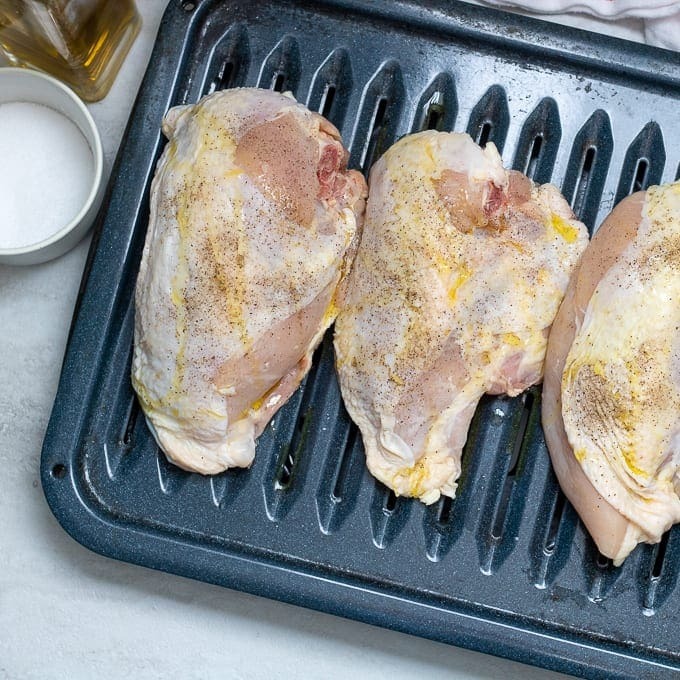 Place chicken breast on a large baking sheet. Drizzle the chicken breasts with olive oil and liberally sprinkle salt and pepper on each side of the chicken breast. Place the thermometer probe into the middle of the thickest chicken breast. Set the alarm for 162 degrees Fahrenheit. the chicken will reach 165 degrees after resting. Roast chicken breasts at 350 degrees until the thermometer reaches 162 degrees, about 40-45 minutes. Remove chicken from oven and loosely tent with foil. Once your chicken has been rested, you can serve immediately or use the meat for meal-prep or a recipe that calls for pre-cooked chicken. Once the chicken breasts have cooled, cut the chicken off the bone. Be sure to reserve the bones for homemade chicken stock. Serve chicken, or slice or shred chicken to serve or use later. I like to use my hand-held kitchen mixer to shred chicken breasts easily. It is smart to roast chicken breasts in large quantities to save on future meal prep. Once chicken breasts are cooked and shredded/diced, measure out 1 to 2 cup portions and place into freezer quart size bags. Store roast chicken breast in refrigerator for up to 3 days. If not using within 3 days, freeze bagged chicken breasts for up to 3 months. 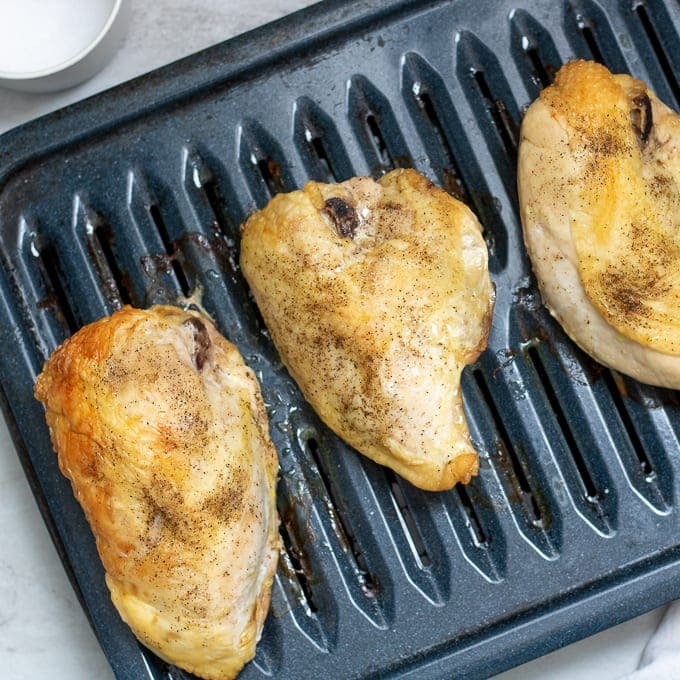 Place chicken breast on a large baking sheet. Drizzle the chicken breasts with olive oil and liberally sprinkle salt and pepper on each side of the chicken breast. Remove chicken from oven and loosely tent with foil. Allow to rest for 5-10 minutes before serving. Nutrition is based on 4 ounce serving of skin-on chicken breast. Use roasted chicken breasts within 3 days or freeze for up to 3 months. I should do this more often. When a recipe calls for shredded chicken, I almost always use boneless skinless chicken breast- and I boil it. How much more flavorful would this be?! Also, cheaper! Great idea. I like to shred my chicken in the kitchen aid. While it’s still warm (and after removing bone and skin), you just put it in the mixer with the paddle attachment and it shreds perfectly. I freeze it to have on hand later, like you mentioned. Roasting chicken is so much more flavorful–and yes, the Kitchen Aid tip is a great one!! I like my meat in larger chunks, so I just chop it. Kristen, thanks for this tutorial. I always have trouble getting all the meat off the bones when I chop. Do you have any tips for that? Thanks for sharing at the Retro Re-Pin Party. Pinned. Hey Julie. I find that it is best to let the meat cool and then get in there with your hands. It is never easy to get the meat off if you use utensils. Hope that helps! looks great! love the idea of making extra and freezing for later. And duh me, never thought to freeze my bones to make broth later. Thanks for these tips and the recipe! Great tutorial here! Thanks for linking up over at the linky party! We hope to see you again this coming Wednesday! I love a Roasted Chicken, this is a great tutorial. Hope you are having a great day and thanks so much for sharing your awesome post with Full Plate Thursday. Amy, This was a wonderful way for me to start my day. I love hearing that people enjoy my recipes. I am so grateful for you taking the time to share this with me. Have a fabulous day! I love this recipe! I made chicken salad with the roasted chicken and it was so flavorful! My whole family loved it. Thank you for this great tutorial! You are so welcome Dini!! We love to use this chicken for chicken salad as well! I have not had such great luck with baking chicken, it usually turns out rubbery and tasteless. But not this recipe! The chicken came out moist, juicy, and flavorful! YAY!!! I am so excited to have solved the issue of rubbery, tasteless chicken! This is perfect for meal prep for the week! Thank you!